in the plane formed by the entrance and reticle slits and makes an angle with the normal to the sensor face of less than a specified limit (typically 32 or 64 deg), the photocell will indicate Sun presence. 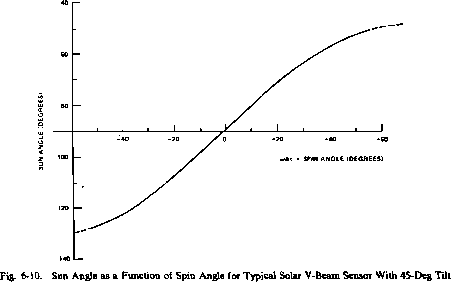 When two such sensors are placed in a V configuration, usually with one sensor entrance slit parallel to the spin axis, the time between Sun pulses is a measure of the Sun angle, as illustrated in Fig. 6-10 (see also Section 7.1). A common digital Sun sensor for spinning spacecraft consists of the two basic components, command and measurement, as illustrated in Fig. 6-11. * The command component is the same as the Sun presence detector shown in Fig. 6-9. 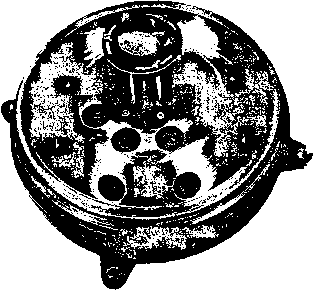 'The discussion in this section is based on sensors manufactured by the Adcole Corporation and flown on a variety of spacecraft Table 6-1 summarizes the physical data for these sensors. Because the nominal FOV for Adcole sensors is limited to ±64 deg, full 180-deg coverage is accomplished by mounting two or more sensor units with overlapping FOVs as shown in Fig. 6-12.